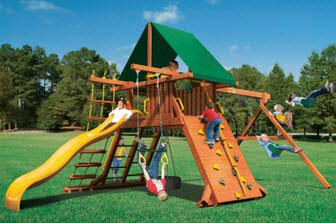 We have been selling playsets by WoodPlay for the last 20 years because over the years they have proven to be the best. 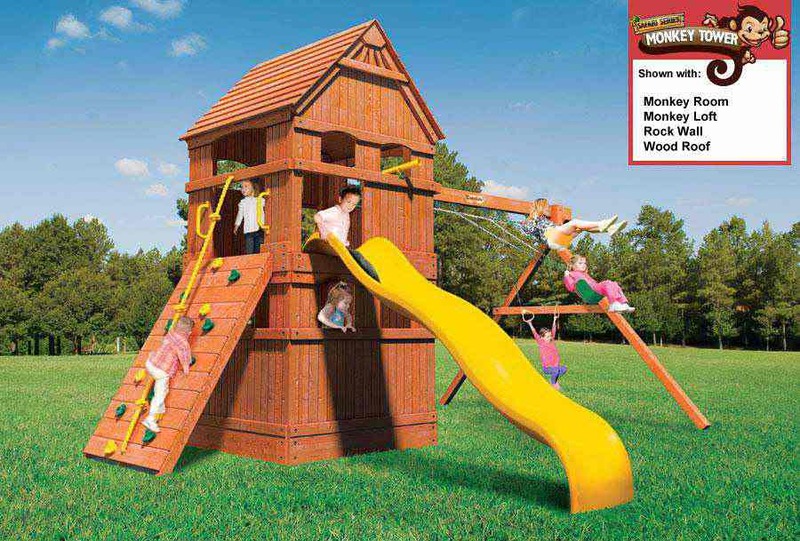 WoodPlay playsets are a premier nationwide brand. They are well known and highly regarded all across the United States and North America. 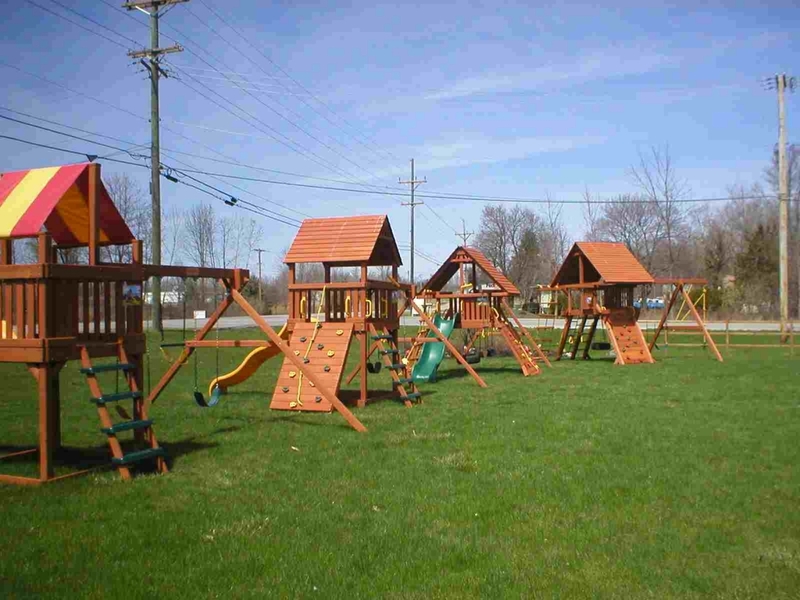 They provide a great deal of versatility in design and style of playsets that they offer. All of the WoodPlay playsets are made of California Redwood which is a sustainable material that the company re-forests and grows continuously. The playsets themselves are made out the sturdiest types of wood in the country, they are well made, well put together, and based on our experience they are the best playsets produced in this country. 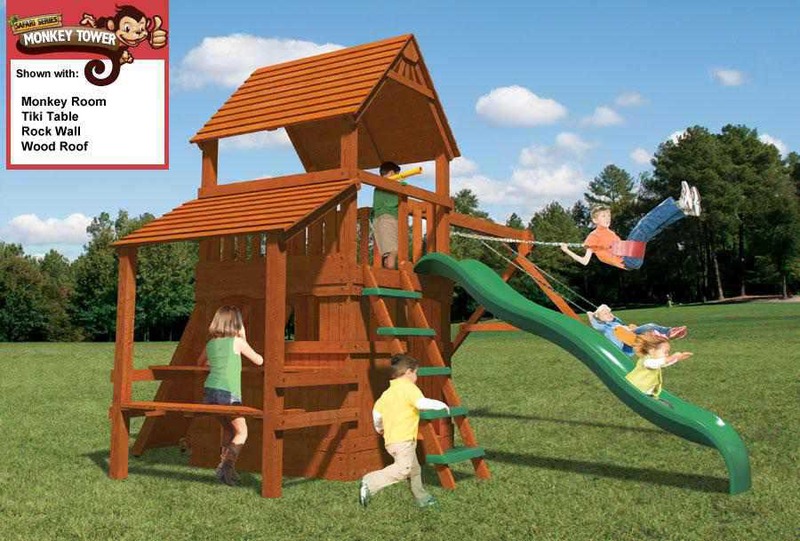 WoodPlay makes very many different styles of Playsets in many different price ranges. 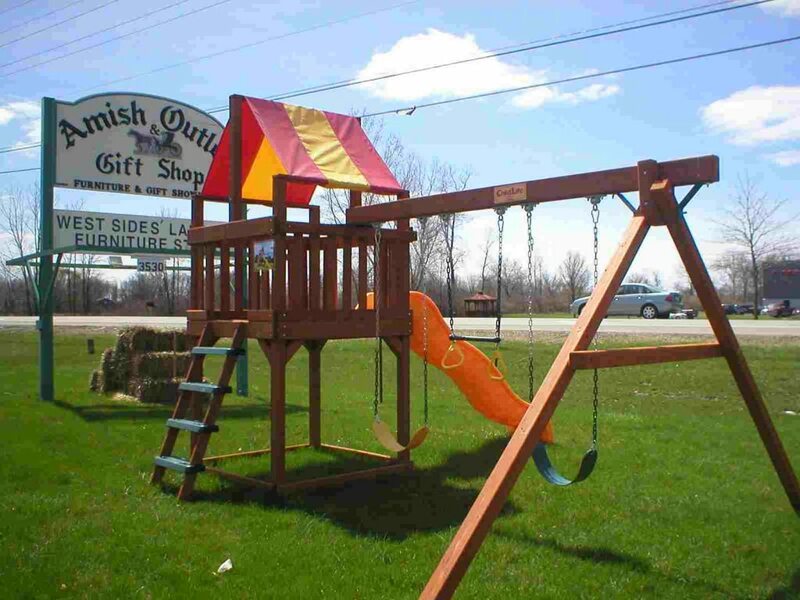 Amish Outlet & Gift Shop is an exclusive distributor of WoodPlay playsets for the entire Western New York region. EXPLORE THE ENTIRE WOODPLAY CATALOG below! 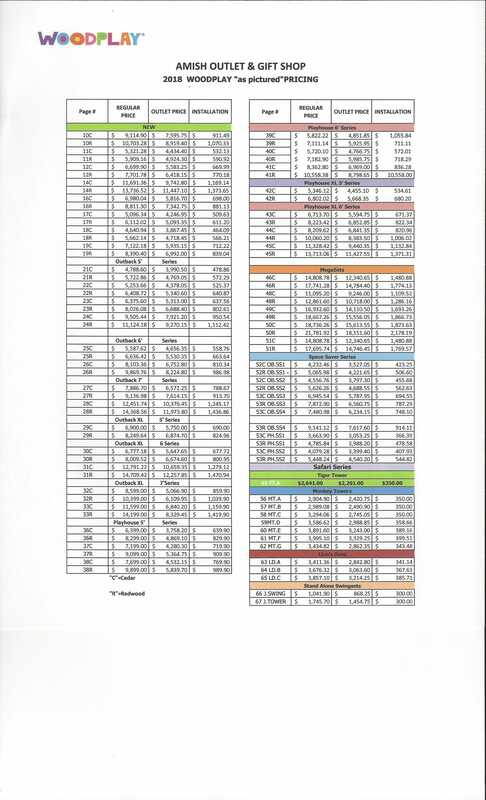 Click Here To Open a 2019 Price List for WoodPlay Playsets. A jpg image document opens in a new tab. Q What Is the Process of Picking the Right Playset? A There are very many different options of styles and sizes and different add-ons for Playsets that we carry. The best way to go about creating the right Playset is for a customer to view the catalog online or to pick one at our store along with the price list and study the pages of the catalog until they can get a good idea of what they want. Once they narrow down their options, they come to our store where together with with our experienced staff we review their choices, their children’s age, the terrain of their backyard where the playsets will be installed and then we come up with the set design that is tailored to their needs and preferences. Often we have all of the components in stock, and when we don’t it takes about three weeks in order to obtain all the parts. Once we get all the parts, in 90% of the cases we assemble the playsets in their backyard. So that is kind of a process of picking the right playset and making sure that what you select works for you, your children, and your backyard. Q Are There Any Terrain Limitations? A These sets are very versatile and will work in most of the backyards. Sometimes it is a little challenging when playset has to be installed on a hill. Only once or twice in our 20 years of experience, we couldn’t install it playset in people’s backyard. Q What Warrantees Come With The Playsets? AThe WoodPlay brand has a limited lifetime warranty which provides lifetime guarantee to the structure of the playset for as long as the customer owns it. 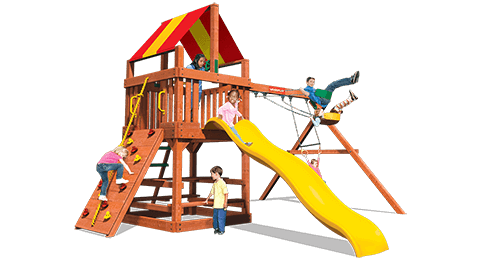 Tthe WoodPlay playsets are designed for residential use. They are not insured for commercial use. If you want to get the best quality Playset/Swingset for your kids you want to buy a WoodPlay playset – come to us, we sell only those playsets – because they are the best! If you want to deal with the company that will not only help you pick the best playset for you, but will also make sure it is assembled and installed properly – come to us. We are ready. 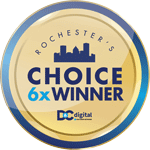 We offer you lower prices without sacrificing quality because we are a family-owned and operated business. If you prefer to support the businesses that grow their lumber in a sustainable manner in the U.S. and manufacture their products in the U.S., then we’ve got that covered too – come to our store! We invite you to our store: we have a trained sales staff that is available to answer any questions about the playsets, including different pricing options. 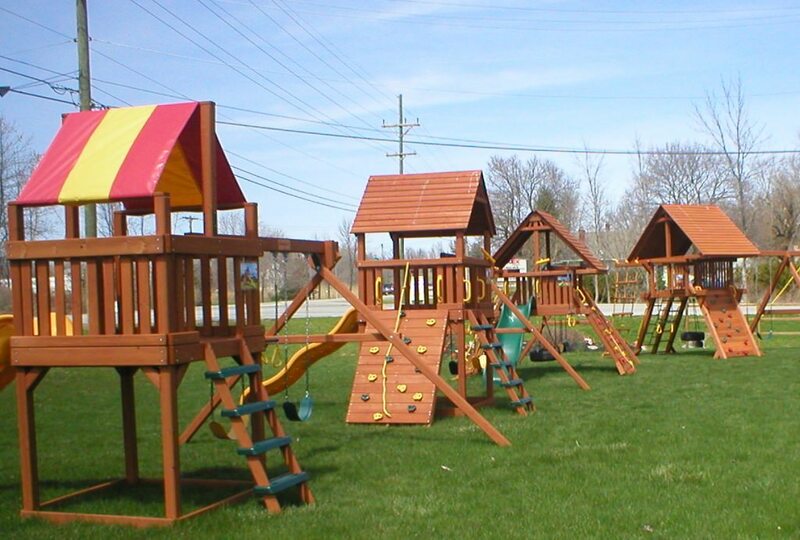 We have a number of display playsets here on our site year-round.